Welsh Corgi Cardigans are low set and long with heavy bones. They have large erect ears and fox-like tails. Welsh Corgi Cardigans are sturdy and powerful. Welsh Corgi Cardigan males are 10-13 inches (25-33cm). Females are 10-13 inches (25-33cm). 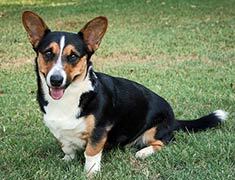 Welsh Corgi Cardigan males are 25-30 pounds (11-14kg). Females are 25-30 pounds (11-14kg). Welsh Corgi Cardigans come in red, sable and brindle black tan and blue merle (black and gray; marbled). Waterproof and shed twice a year, the Welsh Corgi Cardigan's coat must be brust regularly. Welsh Corgi Cardigans are serious and even tempered. They are suspicious of strangers. Cardigans make excellent companions for the elderly and the disabled. This breed enjoys the company of children. Cardigan Welsh Corgis are prone to glaucoma and PRA and should not be overfed. The expected life span of the Welsh Corgi (Cardigan) is about 12-15 years. Active indoors this breed will do well living in an apartment. Welsh Corgi Cardigans are very active and must be exercised regularly. Cardigan Welsh Corgis are in the Herding Group. Find Welsh Corgi Cardigan Puppies with our Free Breeder search!